Say hello to my new favourite dress. 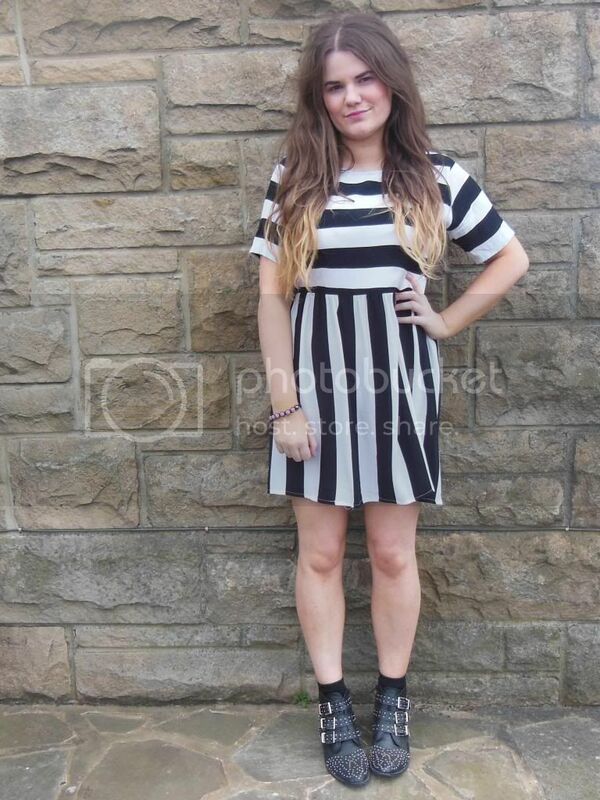 I bought this last month to wear to the FABB Newcastle event, and I've been wearing it quite regularly since... I do love my monochrome clothes, and the fact that this one is thick black and white stripes makes it even more desirable to me (die hard Newcastle United fan forever!) It's such a simple design, but like I often say, simple is most often best, and in this case I stand by that. Another trend which I'm really enjoying is neons and brights, and this jumper fits that description perfectly. I bought it last Summer from the Internacionale teenage range 'Sophie' but it's an exact copy of a Topshop jumper from last year too. I really love lightweight knits, and it's loose fit is perfect for this warm, yet breezy weather. If I could live in dresses with jumpers on top I really would - the comfiest outfits ever! Speaking of the breeze, I hate windy weather... it always leaves my hair looking limp and greasy. Thank goodness for dry shampoo. I decided to keep the accessories for this outfit really simple. 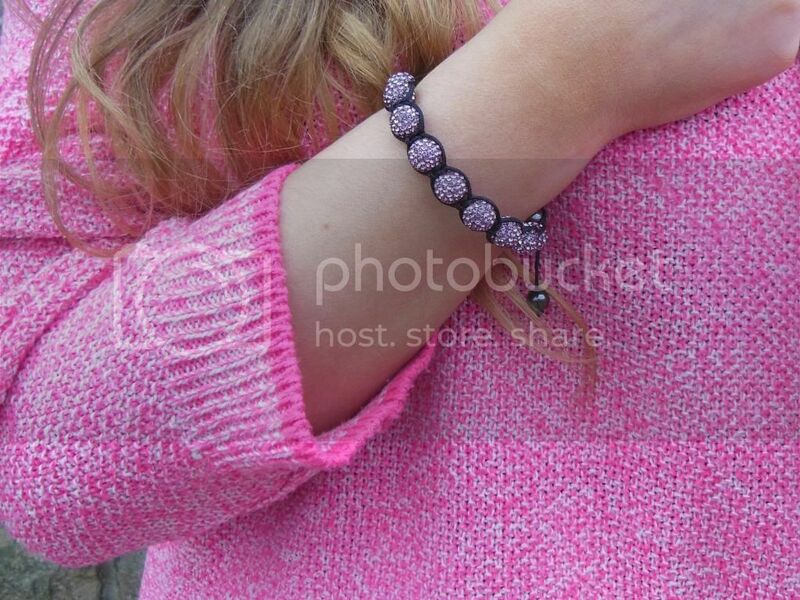 I added cute little black ankle socks with my studded boots, and a beautiful pastel purple coloured bracelet which I was sent a few weeks ago. I'm so pleased with it, for once, it's a bracelet that actually fits me (pretty much every bracelet I own is huge around my little wrists) and it's such good quality, really heavy weight and so sparkly in real life - I'll be wearing this loads over the summer. In other news, I noticed that my Macbook screen has cracked... no idea how. I'm gutted, and a few people on Twitter have told me that it's really expensive to fix - not good. Tor you look incredible! The monochrome looks awesome on you. I've rekindled my love for motel recently, I like how they're branching out from the insanely tight bodycon. You look so chic! I love the pop of colour the jumper gives! 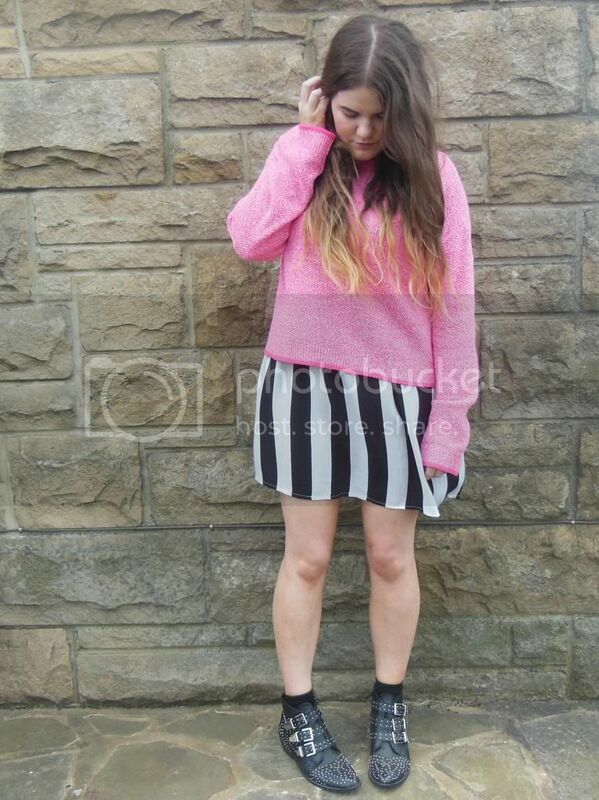 Love this outfit, the pink is lovely with the stripes! you look amazing! I want that dress! are you going to the glamorous and Style Etc mag event tonight? Great outfit. You looked very beautiful with it.